The Naya Pants are part of Sherpa Adventure Gear’s Women’s Lifestyle Collection. Made of nylon with some spandex, they are purported to be lightweight and quick to dry. The fabric is a bit rough to the touch, feeling sturdy but also thin and light. The waistband is lined with a soft fleecy fabric, which is very comfortable against the skin. On the upper left leg is the text “Sherpa” and on the back of the pants, near the top, is the Sherpa Adventure Gear logo. Both are reflective. The features of the pant indicate to me that these are well thought out hiking pants. There are pockets! 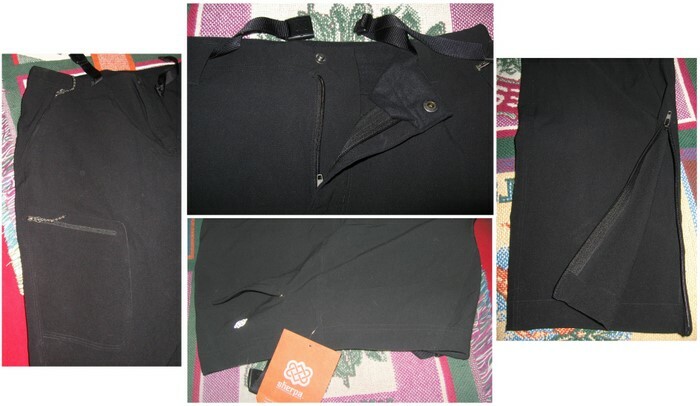 There are two zippered front slash pockets, two zippered thigh pockets, and a zippered rear pocket hidden in the seam. All of the zippers are plastic with metal pull. The slash pockets and the back pocket are lined on one side with the same soft fleecy material that lines the waistband. The bottoms of the pant legs are 18.5 cm (7.3 in) wide and have a 23 cm (9 in) long zipper, also plastic with a metal pull. The Naya pants close with a zipper and snap, and have a webbing belt. The belt is enclosed in the waistband most of the way around, and closes with a buckle. At the front of the pants, on each side of the closure, are belt loops, though there are no belt loops anywhere else around the waist. Additional features of the pants to note are the articulated knees and the gusseted crotch, which are excellent features in pants designed for people who will be hiking in them. The size 6 pants have a 29 in (74 cm) inseam and a crotch-to-waist measurement of approximately 23 cm (9 in). The website gives a good indication of the features and appearance of the pants. However, the sizing information is less obvious. I found a sizing chart by opening the Sherpa Adventure Gear catalogue and flipping to the back. However, the women’s sizes listed there are XS-XL, and these pants come in numerical sizes. Additionally, the chart indicates that the pants have a 31-32 in (79-81 cm) inseam in all but the smallest size, which has a 30-31 in (76-79 cm) inseam. As I mentioned above, the sizing on these pants is numerical. Based on the sizing chart, I fit firmly in the size medium for the waist and hip sizes, and usually wear pants with about a 30 in (76 cm) inseam. I received a size 6. My first impression when I put the pants on was that they were very lightweight and comfortable, and that the material was cool to the touch. My next impression was that...uh, oh, they’re too tight in the hips. And my third impression was that I haven’t had pants that come up to my natural waist in quite a few years. The size 6 pants, pulled up to my natural waist so that the crotch is in the right place, are a bit roomy in the waist. Pulled down to where the waist fits perfectly (and where I usually wear my pants these days), they’re about an inch too long in the crotch. Either way, the fabric is stretched quite tightly across the hips, though thanks to the stretch in the fabric they’re not uncomfortable. When the slash pockets are unzipped, they gape quite badly. Through the rest of the leg, the pants fit just fine. The length is a tad long on me, but with shoes on is fine, and the pants aren’t bunched too badly or dragging on the ground. Since this will be a winter test for me, and since there’s already snow on the ground and below-freezing temperatures here, I tried several base layers under the pants. Any of them other than my very thinnest pair (which don’t offer much insulation) weren’t feasible. With all that in mind, I am exchanging the size 6 for a size 8. Sizing aside, I like the feel of the fabric, the styling and features of the pants, and the very comfortable lined waistband. The Sherpa Adventure Gear Naya Pants are a nice-looking hiking pant with lots of pockets (yay!) and nice features and styling. I am looking forward to the bigger size and getting out in the snow!! I received the size 8 Naya pants about a month after writing my initial report, and am happy to say that they’re a much better fit! The leg length seems about the same, the crotch-to-waist length seems about the same, the fit of the waist seems about the same, but they’re not too tight in the hips anymore. They’re great for winter, because I can now put all sorts of baselayers underneath. I’m not a huge fan of the high waist. Although it’s great for stopping drafts, I generally tuck my shirt into my pants to accomplish the same thing. The waist isn’t tight, so it doesn’t dig in too much when I bend over, but it definitely does a little bit, especially with a pack on. In the month or so that I’ve had the larger size Naya pants, I’ve worn them on one walk on the beach, two trail runs, one day hike, and to one Search & Rescue practice. The walk on the beach was in The Bahamas in the evening, once the temperature had dropped to about 15 C (59 F) and a cool breeze had come up. I rolled up the pants so that they would not drag in the sand. The trail runs were on packed-snow trails at temperatures down to -10 C (14 F) in clear, sunny conditions. The day hike was supposed to be a 5 km (3.1 mi) snowshoe, but someone had beaten me to the trail and already packed it down with snowshoes so I just walked. That day it was snowing and -7 C (19 F). Search and Rescue practice was a mix of indoor and outdoor work, which definitely tested the range of motion of the pants as we learned how to remove a helmet from someone while maintaining spinal control. For the runs, hike, and practice I wore long underwear underneath the pants to combat the cold. I love the pockets on these pants! I can put my handkerchief in one thigh pocket, my lip balm in the other one, and I still have pockets left over for keys and whatever else. While trail running/geocaching I actually had my GPS receiver in one of the thigh pockets, though that was a bit bulky and uncomfortable. I tend to use the thigh pockets more than the slash pockets, because stuff in the slash pockets digs into my leg as I walk or bend and can be uncomfortable, plus the thigh pockets are easier to access with a pack on. These aren’t really winter pants from a warmth perspective, but with the right baselayer underneath I’ve been comfortable in them. In The Bahamas I was comfortable even in relatively warm temperatures with lots of humidity. Although they were maybe a little overkill for walking on the beach, they broke the wind well and also breathed well. Although I haven’t gotten them really wet yet, they sloughed dry snow off with no trouble while I was hiking. They also did well in the durability and dirt-resistance departments while I was crawling around on the floor at Search & Rescue practice. I have washed the Naya pants twice in my regular wash and hung them to dry and so far they seem as good as new, though the last wash seems to have left some soap residue on them or something else white. I’m pretty sure that’s my fault, not the fault of the pants!! The Sherpa Adventure Gear Naya Pants are performing well so far. I really like the pocket options and that they’re roomy enough for baselayers underneath, though I’m not sold on the high waist. 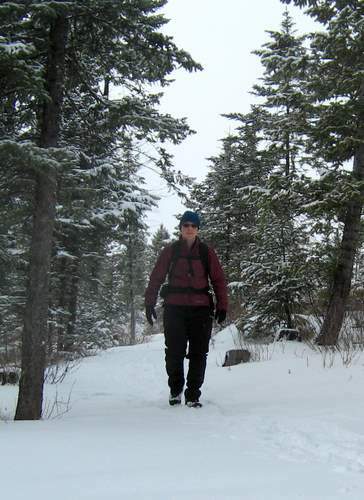 During the Long Term testing stage, I continued to wear the Naya pants for Search & Rescue, snowshoeing, trail running, and cross-country skiing. That use totalled 2 snowshoeing trips, 1 trail run, 6 cross-country skis, 1 day of avalanche skills training, and 2 Search & Rescue responses (one involving nothing outdoors, and one involving some hiking in deep snow). Conditions ranged from clear to dry snow to wet snow (more like slush), and temperatures from -15 C (5 F) to 5 C (41 F). On all but one occasion I wore long underwear (at least one pair) underneath the pants. I have really continued to enjoy using the Naya pants. During the Long Term testing stage I have been able to get a good sense for the snow and water resistance of these pants. On one Search & Rescue training day there was a lot of crawling around in the snow required while setting up and performing transceiver and avalanche scenario practice, and these pants shed the dry snow without any issues. As spring approached, I was able to take the pants for a cross-country ski through a wet snow storm (closer to slush, actually), and the pants did well for a while and then did soak through. Even once wet, though, they still weren’t too cold. Once I got home and spread them out, they dried very quickly. I didn’t get the opportunity to use these pants much without a layer underneath them due to the winter weather, but my experience with a lightweight wool baselayer and high intensity activity has been that they breathe well. They also have had great wind resistance. I am looking forward to continuing to use the pants through spring. The pockets on the Naya pants are awesome. I continue to use the thigh pockets for a handkerchief and lip balm. While geocaching, my GPS did live in a thigh pocket as well, and I had a pen in there too. They hold a surprising amount of stuff. I still don’t use the slash pockets much, and the rear pocket I’ve only used for a few cards. My opinion on the fit of the Naya pants hasn’t changed since the Field Report. They are comfortable and loose enough for winter use. The legs are long on me, but with pants on the length isn’t too bad. 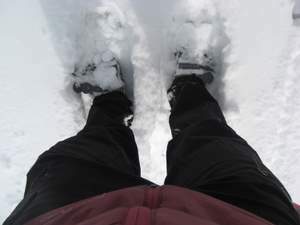 The legs stay down over the tops of my hiking boots even when I’m in moderately deep snow and not wearing gaiters. I still think the waist is a little higher than I really like; the waistband does dig into my waist a bit when I bend. I sometimes wear the pants a bit lower on my hips, but then the crotch is too long. It’s just not quite the right fit for me. I have washed the Naya pants another five times in my regular dark wash and hung them to dry. They still look as good as new. I haven’t noticed any deterioration of the performance of the pants (wind/water resistance) from washing. The Sherpa Adventure Gear Naya pants are a great, functional hiking pant. The number and functionality of the pockets is great and they do well with wind, water, and snow resistance. Unfortunately the fit isn’t great on me, but I will continue to use them for hiking into spring and especially in the winter. Thanks to Sherpa Adventure Gear and BackpackGearTest.org for the chance to test these pants!